In a move that will get well-heeled Drobo owners salivating WD has announced a 6TB Red drive costing just $299, setting the industry a new high water mark in the areal density stakes. This is a 5-platter drive, with 1.2TB/platter areal density, intended for NAS use, and coming in both 5TB and 6TB versions. It spins, we understand, in the 5,400-5,900rpm area using Intellipower, has a 64MB cache and uses a 6Gbit/s SATA interface. 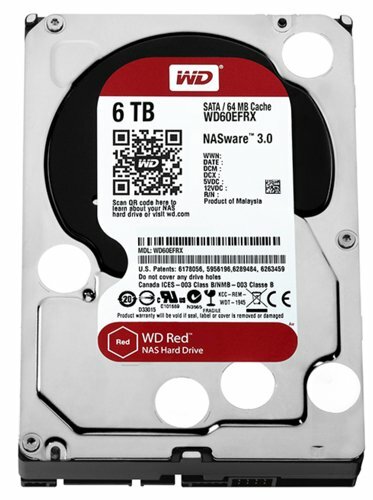 WD Red drives range from 750GB to 6TB, are for up to 5-bay enclosures, and classed as consumer NAS products. There is now an accompanying Red Pro line, with from 2TB to 4TB capacities, which is for business use in 8-16-bay enclosures. The existing Re line is for entry-level to high-end datacentre NAS implementations. Drobo owners, who can populate their enclosures with third-party drives, have now got an enticing upgrade option available once their current drives fill up. We might expect WD to update its four bay Sentinel Windows Storage Server line of desktop and 1U rackmount shelf products which are listed as using 4TB currently. Moving to 6TB drives would give them a 50 per cent capacity upgrade. Ditto its My Cloud NAS products. WD sibling HGST has a 6TB helium-filled drive. Currently HGST and WD are forced to operate independently, due to the Chinese regulator MOFCOM’s ruling following Western Digital’s purchase of HGST two years ago. Putting this areal density level to work in HGST’s seven platter helium drives would produce an 8.4TB drive. Toshiba has 5TB MG04 and MC04ACAnnnE drives spinning at 7,200rpm. Seagate has a 6TB 6-platter product used in a LaCie external storage product. It spins at 7,200rpm and has a 1TB/platter level areal density. The Red drive has a 3-year warranty and the manufacturer’s suggested retail price (MSRP) is a 5TB Red is $249.00 (£199.00) and $299.00 (£240) for the 6TB product, less than $0.05/GB.